Once upon a time, a demon called Sharudo came to Fairy’s land, creating havoc. He built a monster town on a mountain top and dwelled there, ruling over the land below. One day, Sharudo came and took princess Chris to his monster lair. Now it’s up to Ares, a brave soldier in the service of the Fairies, to save Chris. 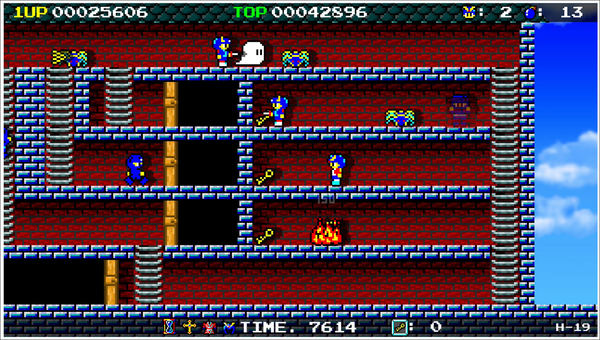 The Demon Crystal is an action puzzle game. Scattered around the stage are numerous keys which help open locked areas. The goal is to find the big key which is needed to open the exit and advance to the next stage. Ares’ only weapon is a limited number of bombs, which explode in a flame and can kill multiple enemies at once. The game consists of 30 stages (houses). The Regista re-release of The Demon Crystal will hit the Switch in Japan sometime this Winter. No word on an NA/EU release at this time.